If you haven’t noticed, I am a huge fan of upcycling things into something “new.” If I can find a way to upcycle something, I will. 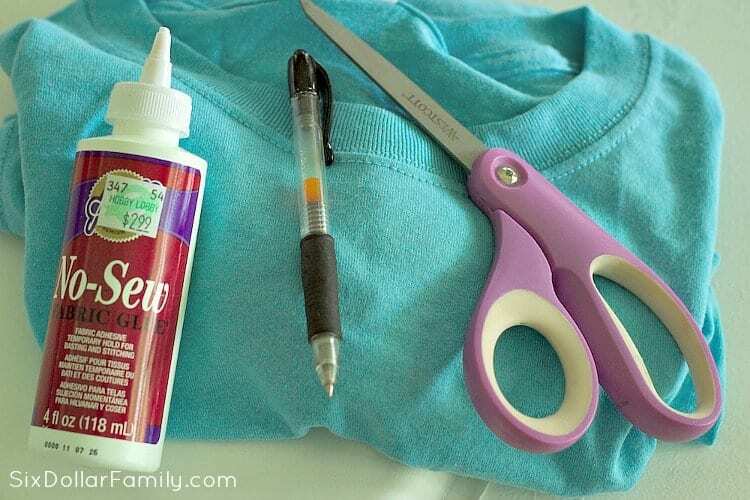 One of my favorite things to upcycle though are t-shirts. Why? Because there are so many different ways you can use them aside from the obvious! I use them in my DIY Dryer Sheets and I’ve used them to make my DIY No Sew Heat Packs. Both projects are awesome and they keep an old t-shirt that is no longer wearable from going into the trash and my money from being wasted on something I can make myself. I like my money. I don’t like wasting my money. Upcycling helps me keep my money. See how this works? 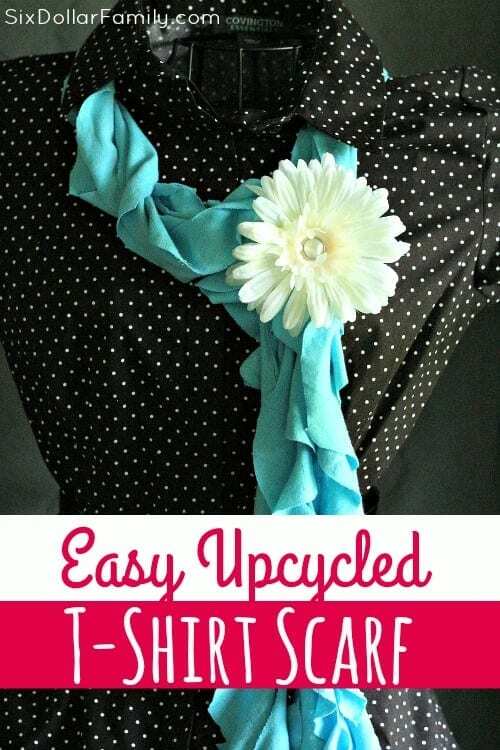 One of my favorite upcycled projects is to take an old t-shirt that can’t be worn by itself and turn it into a wearable scarf. They make great gifts and are a lot easier than you might think. I’ve given these upcycled t-shirt scarves to several people for birthdays or Christmas and every single time, the reaction is amazing. People just don’t think about using something like a t-shirt for a project like this so it can easily “blow” their minds! When you’re looking at your shirts to use for this, keep in mind that the larger the shirt, the better your scarf will be. 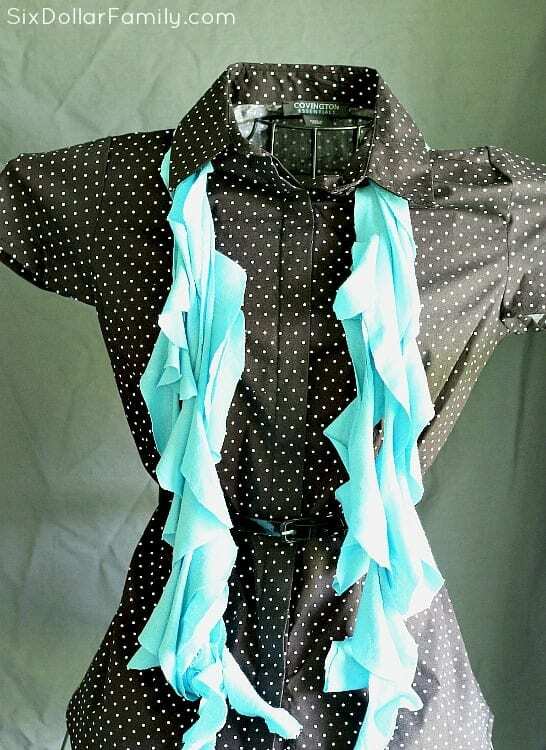 If you don’t have any large shirts, you could always cut different colored strips to create a multi-colored scarf. Just be sure that the colors don’t clash together and it will look just fine. Another thing that I like doing with these is adding a snap to one side and an embellishment with a snap on the other. This makes it easy to snap together for closure and gives it an even more polished look. For the one in this post, I used a large flower as the embellishment. Before you start, make sure to wash and dry your t-shirt. 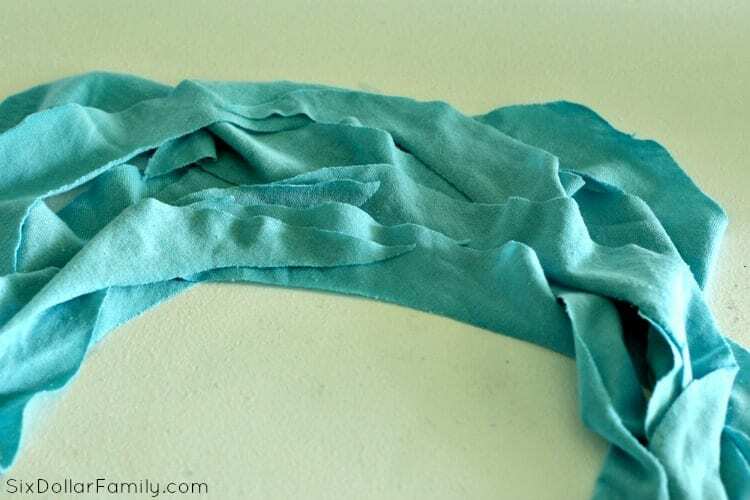 If you’re giving your upcycled scarf as a gift, I would personally use vinegar in the wash cycle to help soften the shirt and to help remove any soap residue that it may have on it from previous washes. 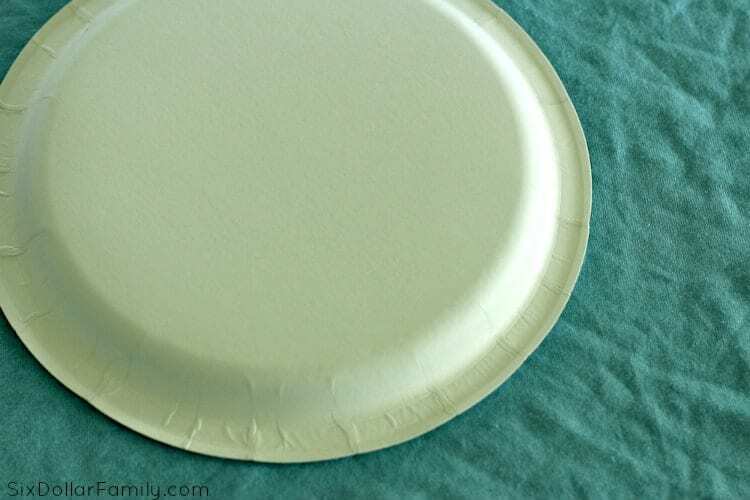 Once your shirt is dry, lay it flat on a table and use the paper plate as a template to cut trace as many circles as you can in the shirt. Be sure that you avoid any seams in the shirt. They won’t work well for this scarf. I can usually get 5-6 circles out of a large shirt then I cut the sleeves off, cut them up their seam and stash them for when I make dryer sheets next. 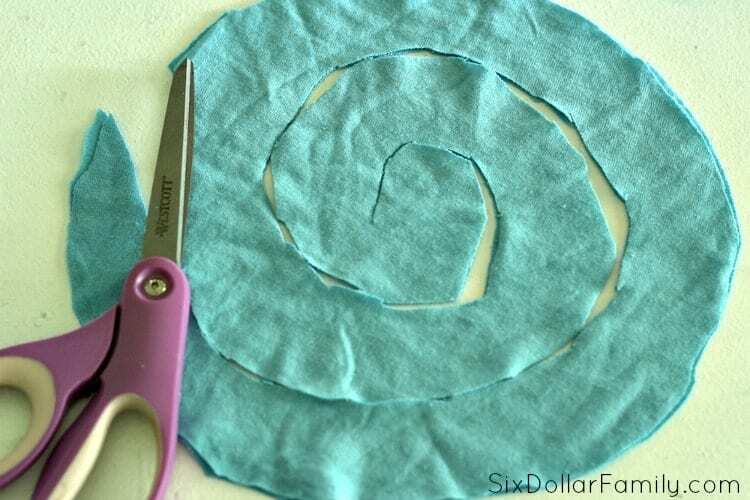 Starting at the edge of each circle, cut out a spiral pattern. Keep your width around 1-2″ but don’t worry too much about them being straight. They don’t need to be and if they’re a bit crooked, you won’t be able to tell when your upcycled scarf is finished. Once you’ve got each one cut out, grab the ends and pull them away from each other so that they curl a bit. Once you’ve got all of the spirals cut out and the ends curled a bit, take 2 end pieces and add a bit of fabric glue to glue them together. Repeat this with each strip connecting each end piece to the larger scarf piece. Once you’ve got all of your pieces glued together, allow them all to dry completely. At this point, the seams will be hidden in the back of the scarf, but if that bothers you, you can always take a small scrap piece of fabric and wrap it around each seam with a small dab of glue to hide them. I usually don’t bother though since it isn’t noticable when the scarf is worn. 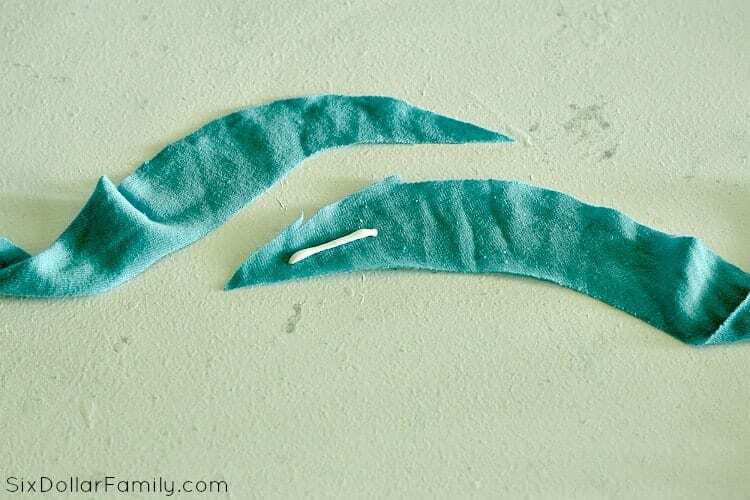 If you’re using any kind of embellishment, wait for the seams to dry completely then add them however you want to.